Activities kicked-off Friday morning with a golf scramble and ran through Sunday’s Big Bash Awards Brunch with colloquia sessions, great meals, spur-of-the-moment mini-reunions, and the ever-popular Alumni Chapel Sing as the centerpiece Saturday. The Big Bash highlight is always the 50-year reunion celebrated during the Friday evening banquet. President Gregory D. Hess presents each 1967 graduate in attendance with a reunion medallion. The class gave back big— nearly two-thirds of the class made gifts totaling a record $9.6 million. The previous record was $8 million by the class of 1966. One of the driving factors behind the attendance is the growing participation from younger alumni. More than 300 attendees from 36 states and three countries signed the reunion book. A new addition to the Big Bash lineup is Wally 8.0, the faculty, alumni, and staff symposium on technology and the liberal arts. This symposium featured alumni, faculty, and staff presenters who demonstrate the breadth and depth of the liberal arts. Presents included professors Matt Carlson, Heidi Walsh, Mike Abbott ’85, Colin McKinney, and Lon Porter. Alumni presenters were Jeremy Bird ’00, Dennis Kennedy ’80, Brian Kopp ’98, Rick Sasso ’82, and David Waldman ’93. Saturday opened with a morning fun run and walk, campus tours, more colloquia, and the legendary Alumni Chapel Sing in the Chapel. Each class held individual Saturday night dinners at locations throughout campus. 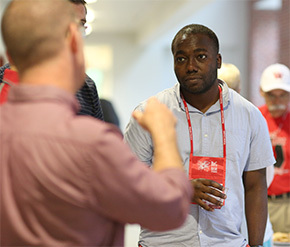 President Gregory D. Hess said to the attendees Friday evening, "What we do here at Wabash College is to be intentionally timeless. You should always feel like Wabash is your home, and we hope you enjoy being back home one more time." The 2017 Big Bash concluded Sunday with the Awards Brunch. The Class of 1967 captured the most titles winning the 1909 Attendance Award with 41.7 percent of their class in attendance; the 1928 Attendance Award for the most people in attendance setting a 50th reunion attendance record with 80 present; the Robinson-Reagan Chapel Sing Award, the Dorman Hughes '43 Award for outstanding reunion leaders, and the Edmund O. Hovey Award for highest percentage participation in the Annual Fund. The Class of 2007 was awarded the 2007 Award for the highest turnout of a young alumni reunion class (celebrating 5th, 10th, or 15th reunion). President Hess concluded the weekend by reminding alumni, "Whether you are having a good day or a bad day, always remember that any day is a little better when you are at Wabash College."